LiveCode LessonsLiveCode LessonsHow to Purchase and License LiveCode ArticlesHow do I Manually Activate LiveCode? If you are installing LiveCode on a computer that does not have internet access you will need to use manual activation. You may also need to do this if you are behind a firewall or if automatic activation has failed for you for some other reason. To do this you select the "Manual" tab in the activation screen, and download your license file from your account. This lesson shows you exactly how to do this. Log in to your LiveCode account using your email address and password. In your Products/LiveCode screen (1), you will see a tab "Offline activation file". Click on this see the area where you can generate your offline license file. 1) Select the version of LiveCode you want to license from the dropdown menu. This must match the version you are trying to install and activate. 2) Enter a passphrase. This can be anything you like as long as it is more than 5 characters, be sure to make a note of it when you enter it as you will need it again when you license. If you cannot remember this passphrase after you have downloaded the license file, you can simply go through this process again and choose another passphrase. 3) Click "download" to download your license file. Once you have downloaded the license, transfer it to the computer you want to license LiveCode on. Make sure the filename ends in .lic. 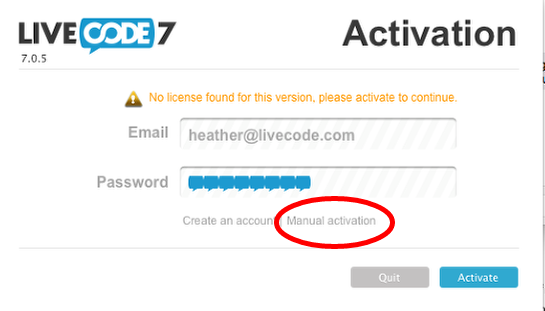 Open up LiveCode and switch to Manual activation by clicking the circled link above. Click on the search icon next to the "License File" box. Select your LiveCode license from wherever you saved it to. (1) Select your license file. (2) Enter your passphrase and (3) click Activate. That's it! 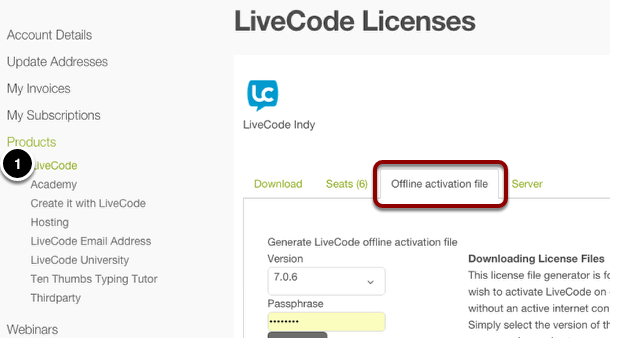 Your LiveCode will be licensed on your offline computer. Note: Your offline license file will expire after a week. If you haven't used it by then, you can simply log in to your account and download a new one. Your LiveCode will not expire once it has been activated, it is only the license file itself that expires. Prev: How do I retrieve my Password and Activate LiveCode? 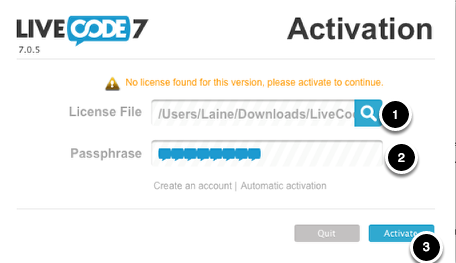 Next: How do I download and activate LiveCode? I am very impressed with the speed of the response to my issue. The instructions are very clear and help me to get LiveCode up and running in no time at all. Many thanks. I have been trying to download a trial license file for manual activation without success. I do not see any where on the site where I can do this. please help.